Boom! Wall Street has surged more than 2%, racking up its biggest one-day gains since March. 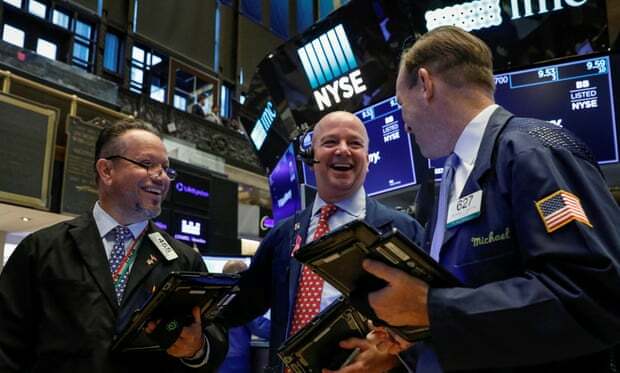 The Dow Jones industrial average jumped by 547 points to end the day at 25,798, a gain of 2.17%. The S&P 500 gained 2.16%, while a solid tech stock rally swept the Nasdaq 2.9% higher. As covered earlier, optimism in New York was boosted by strong results by Goldman Sachs and Morgan Stanley, and Johnson & Johnson. New of a record number of vacancies across US firms, and a jump in industrial production, also calmed some of the anxiety that has been building in the markets. And no sooner had Wall Street closed, than Netflix was reporting results — and impressing traders.